I promise to get back to writing about Portland beer very soon, but I've got to get this last Texas story out of the pipeline after our recent two-week stay in the Lone Star state. For the time we spent in Austin on this trip, we stayed in the northwest suburbs, drawn by the temptation of a free house to ourselves and free use of a car. Most of my hangouts in Austin turned into 15- or 20-mile drives -- even now it makes my head hurt to think about it -- but that led me to pay a couple of visits to the worthy North by Northwest brewpub, and to check out a couple of oases of potable beer in the far lands of Cedar Park. North by Northwest built their business on a platform of good food in a chic setting, accompanied by solid but unadventurous beers. They're flexing a little more beer muscle these days: for example, on the last Monday of every month they tap a firkin of cask-conditioned ale. 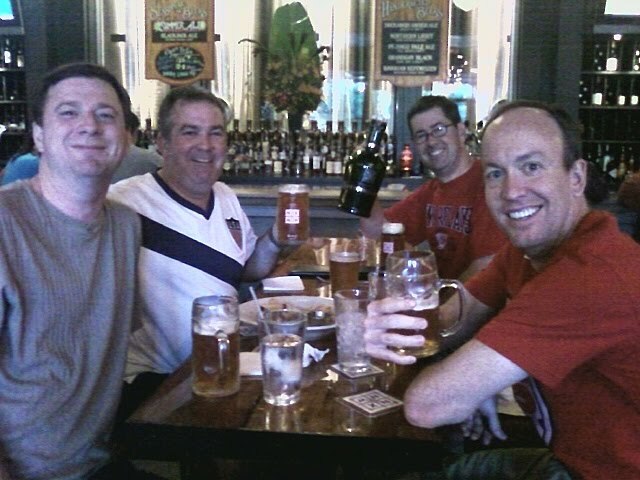 It's a regular event for my Austin beer posse, so it was lucky for me that we were in town for June's tapping of Green Menace, a double IPA dry-hopped in the firkin. It was well done, with great floral hops -- there were leaves floating in my first pint -- and plenty of backbone to support them. Another example of the way NXNW has stepped up their game is that they have one tap dedicated to experimental sour beers, and one to barrel-aged beers. I shied away from the so-called lambic tap, and somehow I never got around to the barrel-aged tap -- I think it had blown on my first visit, and on the second I was pacing myself. Of the other beers I tried, I really liked the Okanagon Black Ale (a malty schwarzbier, not a CDA), and the light, citrusy Summer Ale. The Pyjingo Pale Ale -- one of the original standards -- was not to my liking. There was something gamey about it. 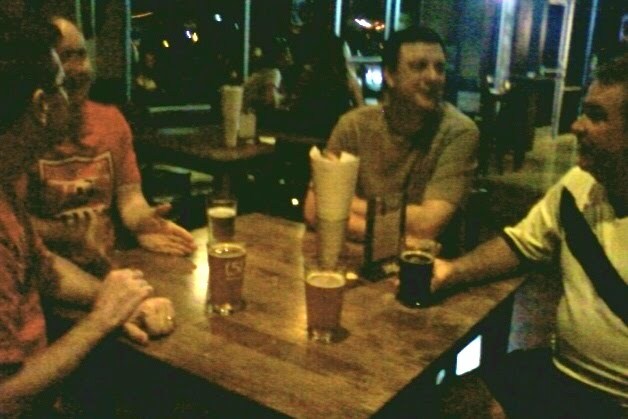 On one of the NXNW outings, I prevailed upon the lads to accompany me 10 miles north to the Dig Pub in Cedar Park, a mere 3.5 miles from where I was staying. Inside an inauspicious strip-mall location is a 30-tap beer geek's paradise. The taps are well-chosen: a variety of Central Texas crafts from Independence, (512), and Real Ale, as well as solid choices from the likes of Dogfish Head, Stone, New Belgium, and even Deschutes. The menu listed Jubel 2010, and I was excited to get the chance to inflict it on some Texans, but it had already blown. The waitresses at the Dig were well-informed about the goods being offered -- good evidence that the place takes beer seriously. There were two dartboards with lots of space to throw, and -- making Lee's night -- free shuffleboard. If you're trapped out there in the hinterlands of Austin, the Dig is a great place to go. 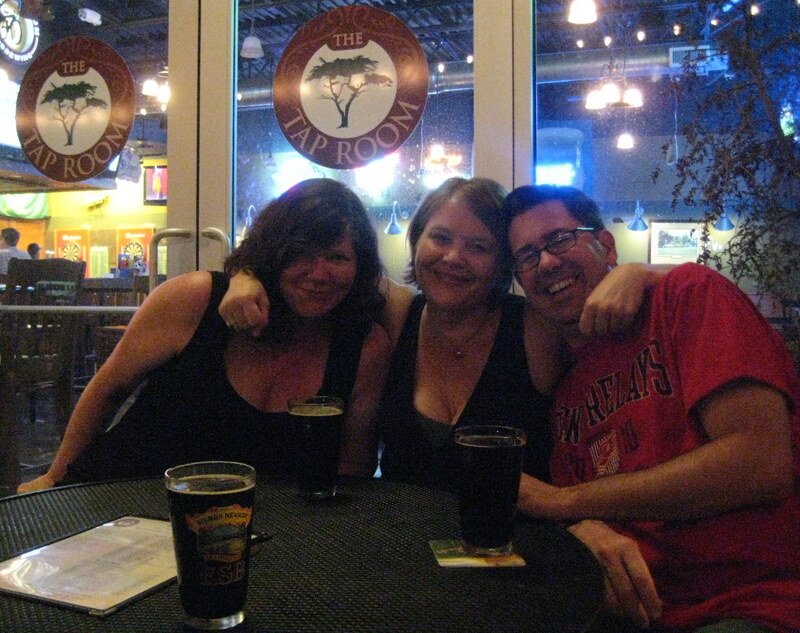 On another night, Lee and Margaret journeyed out to meet Carla and me at the Dig. 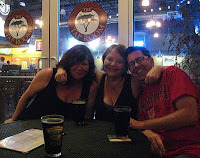 They needed a late dinner, and the Dig kitchen had closed at 11, so after a pint there, we tried our luck at another Cedar Park beer bar: the Tap Room. The Tap Room is also a strip-mall establishment -- come to think of it, there probably isn't any other real estate option in that area -- that boasts 30 taps and a couple of dartboards, but the resemblances to the Dig end there. About a third of the taps are crap -- that's OK, the place is a sports bar -- so that leaves about 20 decent taps, including the enjoyable (512) Pecan Porter. But the craft beer choices are just a veneer. The staff can't tell you anything about them, and even the menu lists them in puzzling ways. For example, Widmer W'10 and Widmer Hef were on the menu, as well as "Halo IPA" (I think you mean "Widmer Broken Halo IPA"). Similarly, New Belgium Fat Tire was on the list, and somewhere else was "Ranger IPA" (not listed as NB). You might choose the Tap Room over the Dig if there's a sporting event you need to catch, or someone in your party will only drink wimpy downstream beer, or if you want to avoid a Comedy Open Mic night at the Dig. Still, the Tap Room has a pretty good variety for that part of the 'burbs. Maybe it will improve its beer IQ over time. Until then, stick to NXNW and the Dig for your suburban Austin pub crawls. I will probably never go to Texas (though I imagine Austin would be my location were it to happen), but I've been enjoying the posts. Never say never, Jeff! Austin is definitely worth a visit, if not for the beer then for the comfort food and the swimming pools. Oh yeah, and the music. Sounds like you had a great time in Austin judging by your twitter feed and blog posts Bill. We often stay with friends in NW Austin when we visit so I try to make my way to NXNW whenever in town. The standard lineup always left a little to be desired but the seasonals and on-offs were frequently interesting. I will have to try the Dig Pub when we head back that way, maybe in the spring. NXNW is a godsend for this NW Austin suburbanite, being the only place I know that will fill a corny keg with fresh, potable brew. Py Jingo Pale Ale earned a permanent spot in our kegerator by passing a blind taste tests with wife and self against bottled faves, Full Sail PA & Stone IPA. NXNW is a short drive from Austin Homebrew Supply (so you can make your own), & Specs (where you can buy nationally-distributed kegs). Haven't bothered with Specs--NXNW's stuff is cheap, fresh, and kegs are filled overnight (Just ordered a keg of NXNW's Green Menace IIPA). Hair of the Dog Inventory Running Low?